In this chapter, you learn how to connect an LCD to your Arduino, and you learn how to use the Arduino LiquidCrystal library to write text and arbitrary custom characters to your LCD. After you have the basics down, you add some components to make a simple thermostat capable of obtaining local temperature data, reporting it to you, and controlling a fan to compensate for heat. An LCD will give you live information, a speaker will alert you when the temperature is getting too hot, and the fan will turn on to automatically cool you down. To complete the examples in this chapter, we use a parallel LCD screen. These are extremely common and come in all kinds of shapes and sizes. The most common is a 16×2 character display with a single row of 16 pins (14 if it does not have a backlight). In this chapter, we use a 16-pin LCD display that can show a total of 32 characters (16 columns and 2 rows). If your display didn’t come with a 16-pin header already soldered on, you need to solder one on so that you can easily install it in your breadboard. With the header successfully soldered on, your LCD should look like the one shown in Figure 3-1, and you can insert it into your breadboard. 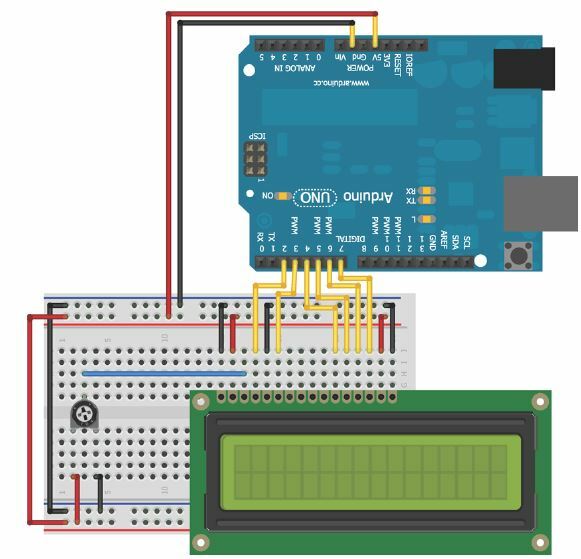 Next, you wire up your LCD to a breadboard and to your Arduino. All of these parallel LCD modules have the same pin-out and can be wired in one of two modes: 4-pin or 8-pin mode. You can accomplish everything you might want to do using just 4 pins for communication; that’s how you’ll wire it up. There are also pins for enabling the display, setting the display to command mode or character mode, and for setting it to read/write mode. Table 3-1 describes all of these pins. The contrast adjustment pin changes how dark the display is. It connects to the center pin of a potentiometer. The register selection pin sets the LCD to command or character mode, so it knows how to interpret the next set of data that is transmitted via the data lines. Based on the state of this pin, data sent to the LCD is either interpreted as a command (for example, move the cursor) or characters (for example, the letter a). The RW pin is always tied to ground in this implementation, meaning that you are only writing to the display and never reading from it. The EN pin is used to tell the LCD when data is ready. Data pins 4~7 are used for actually transmitting data, and data pins 0~3 are left unconnected. You can illuminate the backlight by connecting the anode pin to 5V and the cathode pin to ground if you are using an LCD with a built-in resistor for the backlight. If you are not, you must put a current-limiting resistor in-line with the anode or cathode pin. The datasheet for your device will generally tell you if you need to do this. We can connect the communication pins of the LCD to any I/O pins on the Arduino. In this chapter, they are connected as shown in Table 3-2. Reference the wiring diagram shown in Figure 3-2 and hook up your LCD accordingly. Now your LCD is ready for action! Once you get the code loaded in the next section, you can start displaying text on the screen. The potentiometer will adjust the contrast between the text and the background color of the screen. The arguments for the LCD initialization represent the Arduino pins connected to RS, EN, D4, D5, D6, and D7, in that order. In the setup, you call the library’s begin() function to set up the LCD display with the character size. starts in the top-left corner. WARNING: The library does not check for strings that are too long. So, if you try to print a string starting at position 0 that is longer than the number of characters in the row you are addressing, you might notice strange behavior. Make sure to check that whatever you are printing will fit on the display! Using this knowledge, we can now write a simple program that displays some text on the first row and that prints a counter that increments once every second on the second row. Listing 3-1 shows the complete program to accomplish this. Load it on to your Arduino and confirm that it works as expected. If you don’t see anything, adjust the contrast with the potentiometer. This program combines all the steps that you learned about earlier. The library is first included at the top of the program. A time variable is initialized to 0, so that it can be incremented once per second during the loop(). A LiquidCrysal object called lcd is created with the proper pins assigned based on the circuit we’ve already wired up. In the setup, the LCD is configured as having 16 columns and 2 rows, by calling lcd.begin(16,2). Because the first line never changes, it can be written in the setup. This is accomplished with a call to lcd.print(). Note that the cursor position does not need to be set first, because we want the text to be printed to position (0,0), which is already the default starting location. In the loop, the cursor is always set back to position (0,1) so that the number we print every second overwrites the previous number. The display updates once per second with the incremented time value. What if we want to display information that cannot be expressed using normal text? Maybe we want to add a Greek letter, a degree sign, or some progress bars. Thankfully, the LiquidCrystal library supports the definition of custom characters that can be written to the display. In the next example, we use this capability to make an animated progress bar that scrolls across the display. After that, we take advantage of custom characters to add a degree sign when measuring and displaying temperature. Creating a custom character is pretty straightforward. If we take a close look at the LCD, you’ll see that each character block is actually made up of a 5×8 grid of pixels. To create a custom character, we simply have to define the value of each of these pixels and send that information to the display. To try this out, we make a series of characters that will fill the second row of the display with an animated progress bar. Because each character space is 5 pixels wide, there will be a total of five custom characters: one with one column filled, one with two columns filled, and so on. Putting this all together, we can add the rest of the characters and put two nested for() loops in our program loop to handle updating the progress bar. The completed code looks like the code shown in Listing 3-2. At the beginning of each pass through the loop, the 16-character-long string of spaces is written to the display, clearing the progress bar before it starts again. The outer for() loop iterates through all 16 positions. At each character position, the inner for() loop keeps the cursor there and writes an incrementing progress bar custom character to that location. The byte cast is not required here because the ID 0 is defined by the j variable in the for() loop.